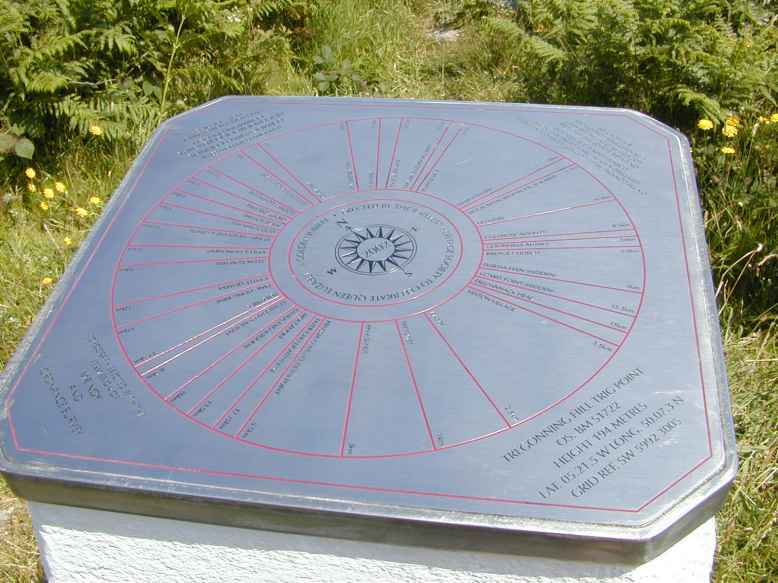 Topograph fitted with permission of Mr Noy and OS in 2002 celebrating QEII jubilee. 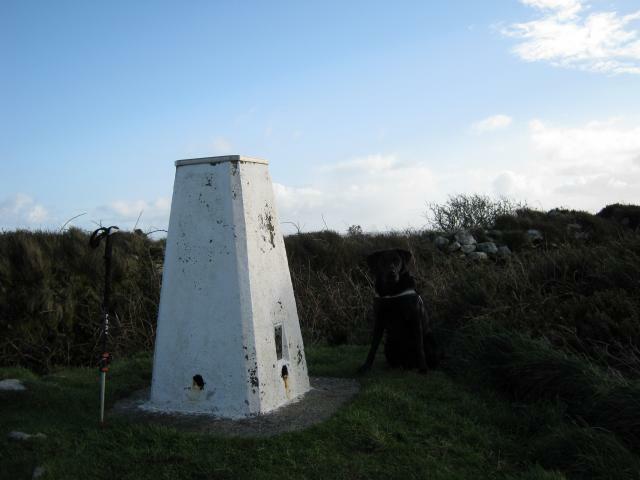 I think this is my favourite trig in Cornwall. 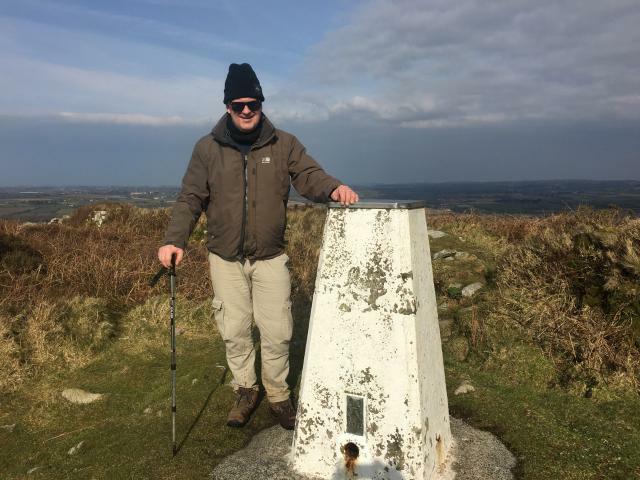 Easy walk up, stupendous all-round views, including St Michael's Mount and, today, HMS Queen Elizabeth at anchor in Mounts Bay, fascinating area around it with old tin mines and chimneys visible. I could happily have spent a couple of hours there! 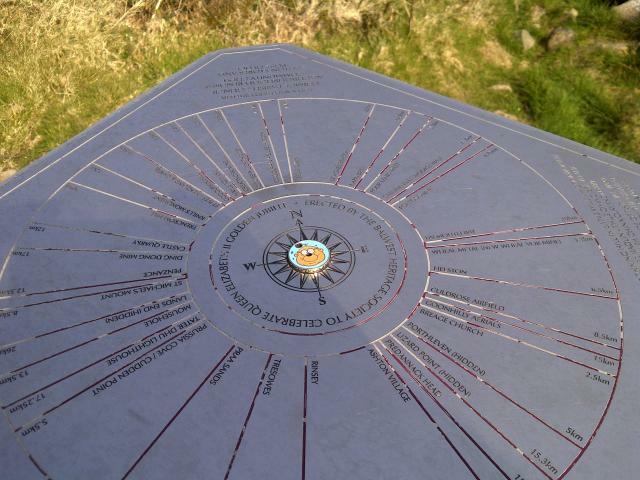 Love the map on the top of the trig point showing where everything is locally! 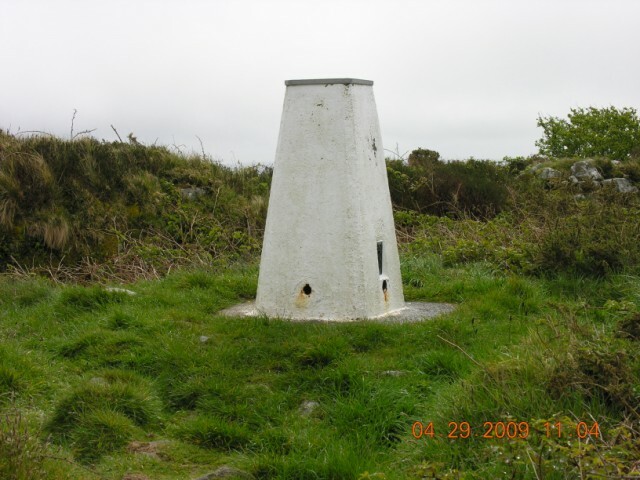 Nothing really to add other than to confirm that it is still there and remains in a good condition with the top covered with a toposcope. 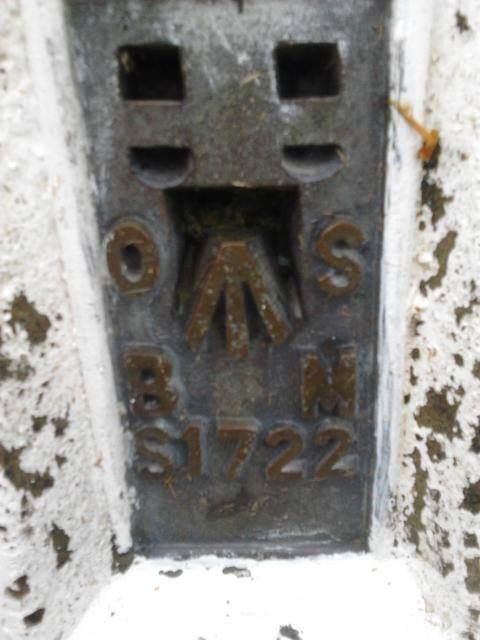 S1722 Tregonning Hill Flush Bracket. 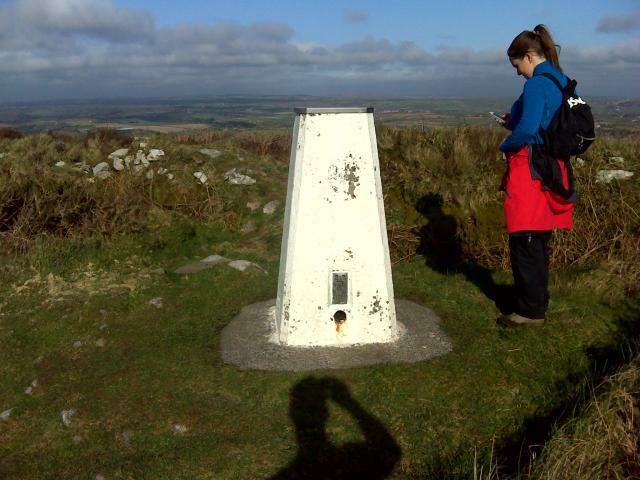 YSM166 Tregonning Hill. 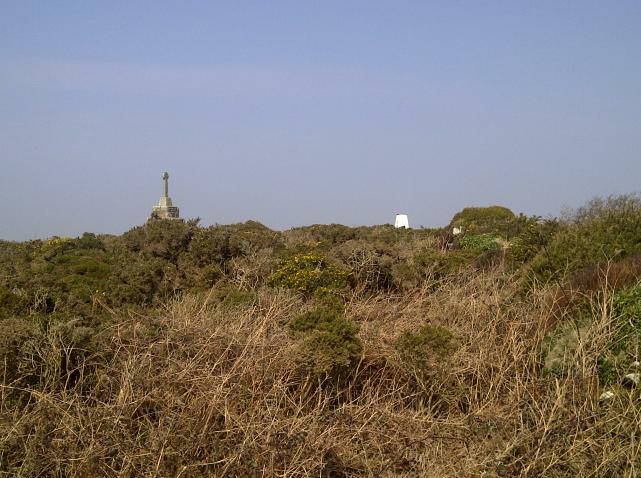 Walked up from the rivet in the dark and found the trig and the war memorial. 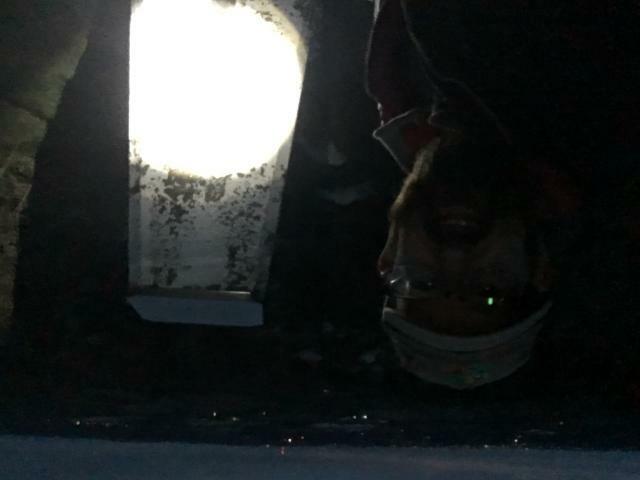 Lovely night time lights. In good condition. 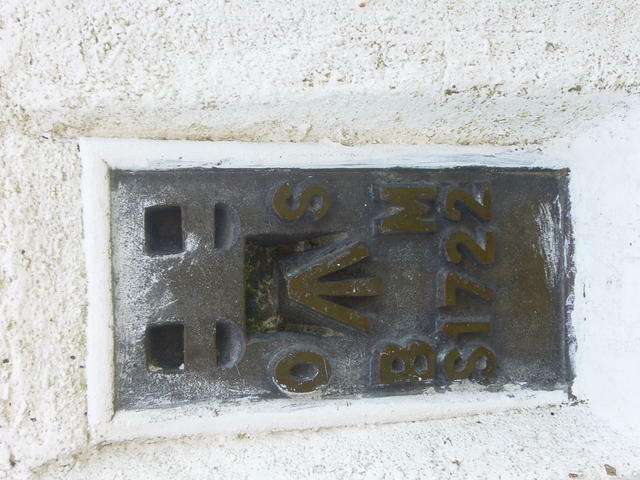 This will in all probability have been my last YOSM find on the Geocaching web site due to imminent changes to the way caches are logged on there. Nice track up to this one but we could see the rain approaching so didn't hang about long. 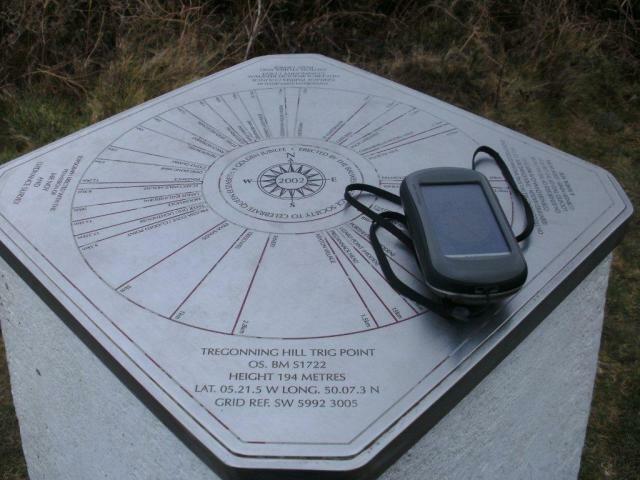 The nearest trig to our holiday cottage, nice circular walk up to it and along the ridge, with interesting mining history. 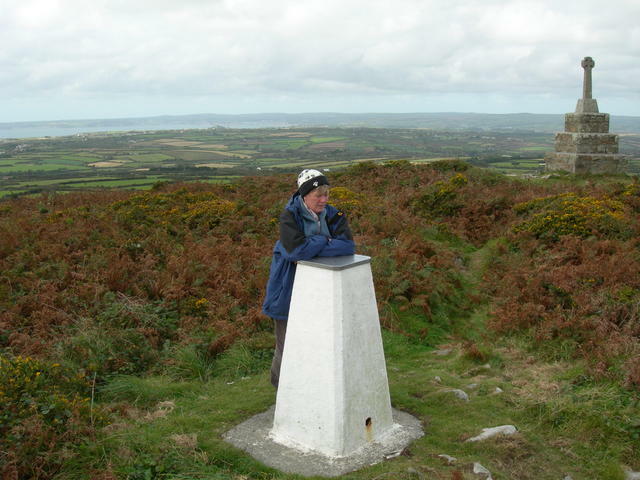 Absolute gale blowing, but the views were excellent in all directions. 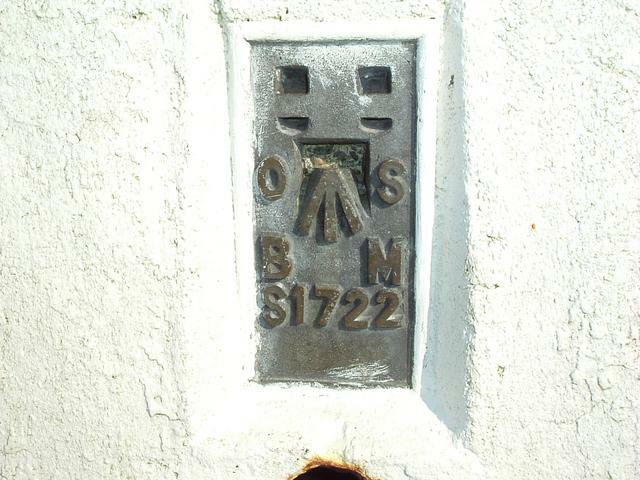 Pillar had been tastefully converted to a very informative toposcope, and all s/holes except SE are open, but otherwise vgc. 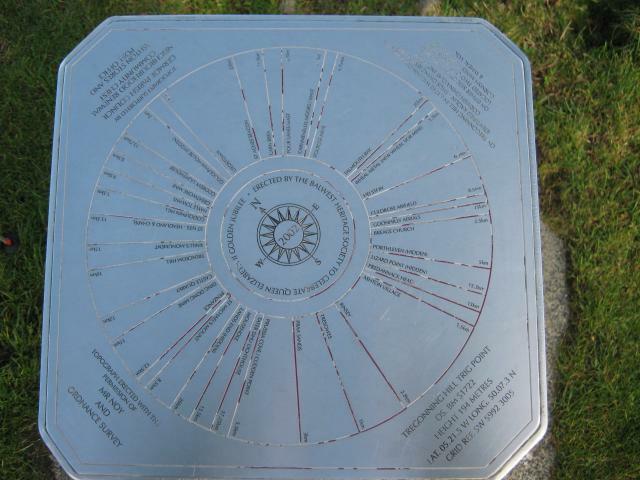 Fine view point, lots of mining history to this area. 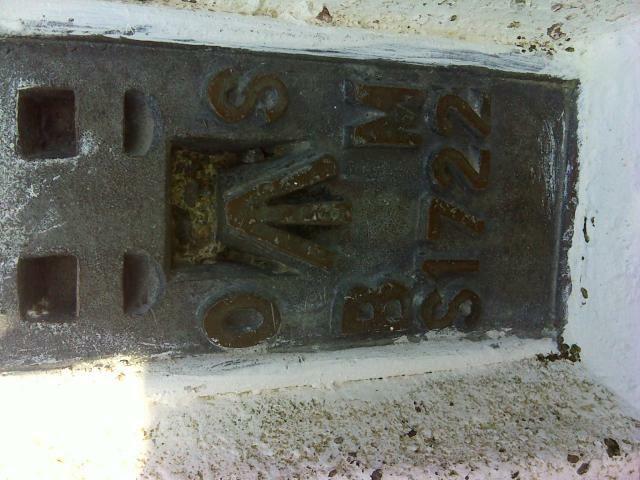 Topograph on top of pillar. 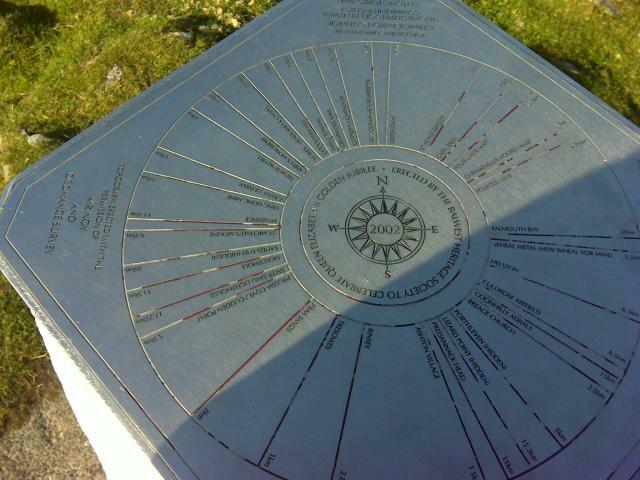 Nice gentle stroll up the footpaths to bag this one. Stunning views made it worthwhile too. 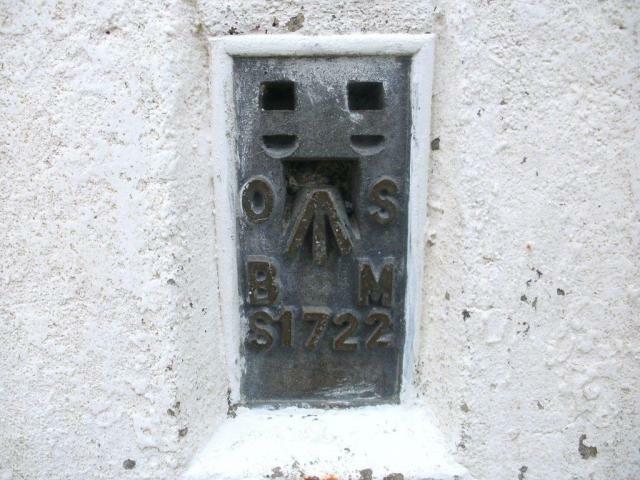 Found as virtual geocache YSM166. 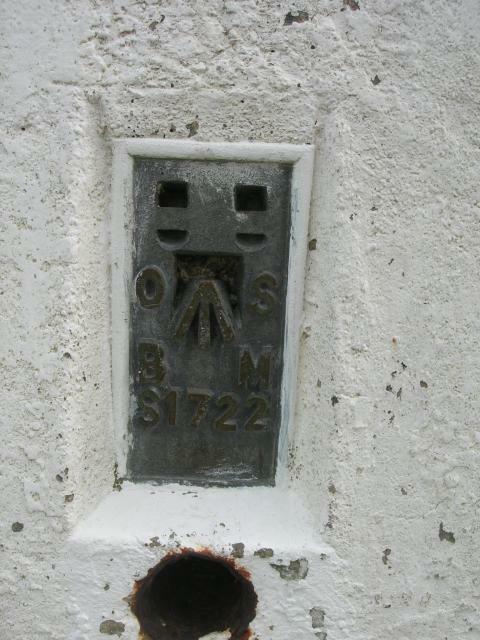 Walked up the hill after finding Balwest Rivet. Very misty so no views to speak of. 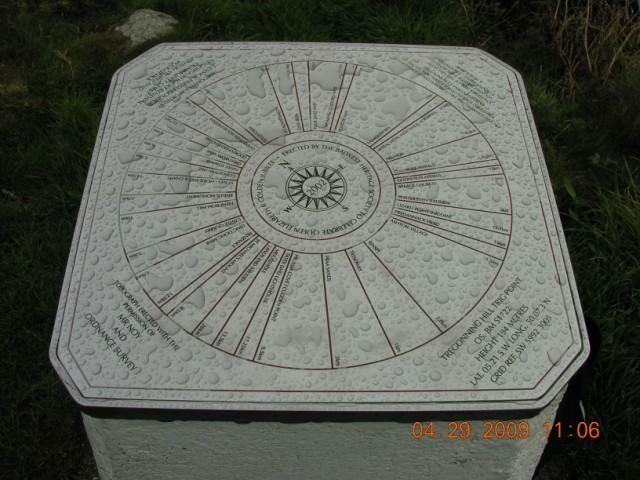 Pillar has been topped with a toposcope celebrating the Queen's Golden Jubilee in 2002. 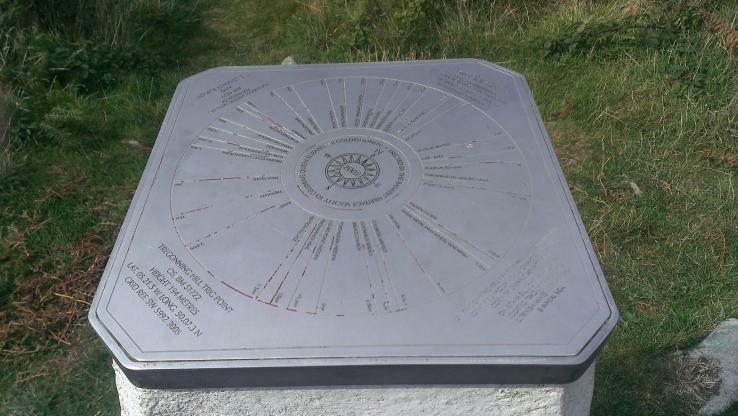 Having completed a long linear walk yesterday from St Ives to Marizion with friends who are now wending their way home to Devon, I was able to detour here prior to returning to my daughter's home in Porthtowan. 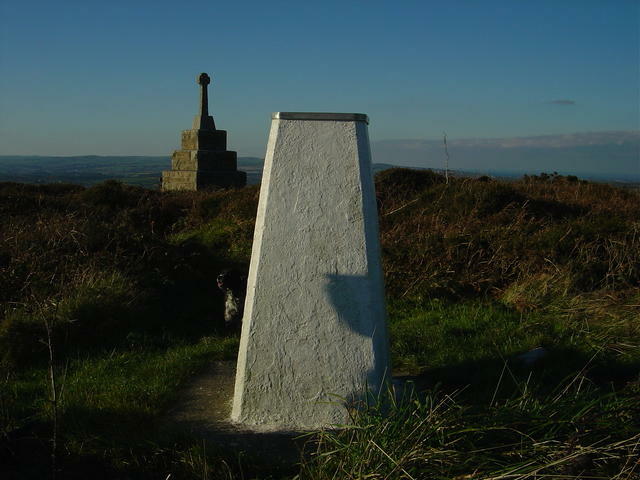 Trig in good condition with a panorama view mounted on top, and a memorial nearby. Good views on a lovely day! 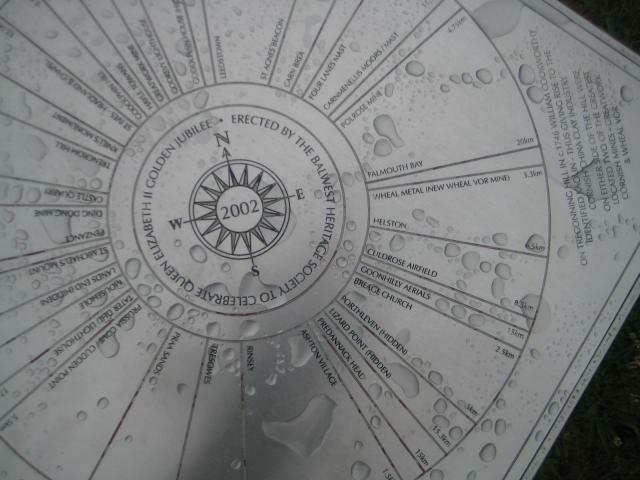 The topograph and the 360 degree views compensated a little for a dismal day. 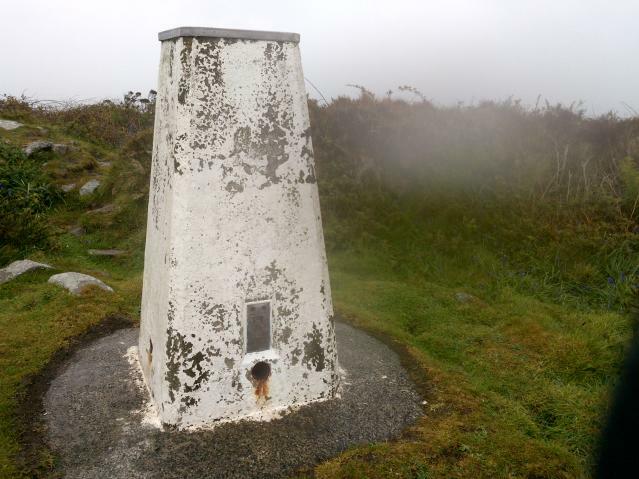 Not sure that a pillar with its top covered by a toposcope should retain its 'Good' status, maybe one of the other admin will comment? As a consequence the spider's condition is now unknown. 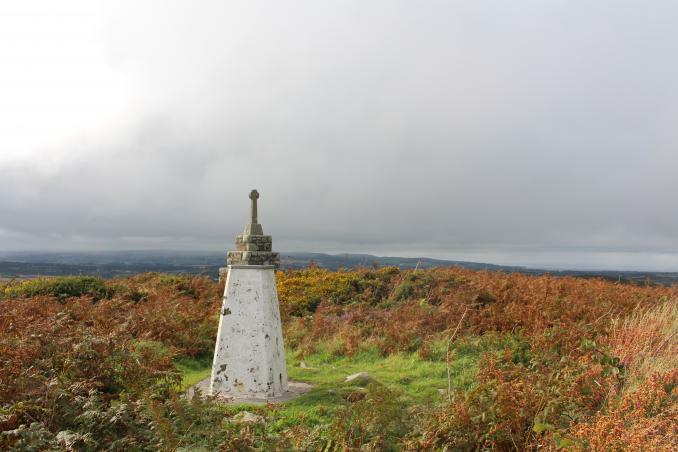 Either way the pillar seems in good condition with a coat of flaking white paint and located in ruins of a Celtic hill fort. 3 sight holes are open, RHD side closed. 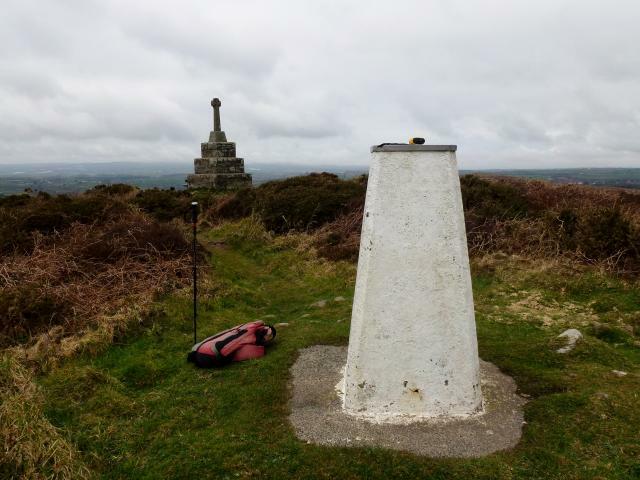 Panoramic 360deg views. 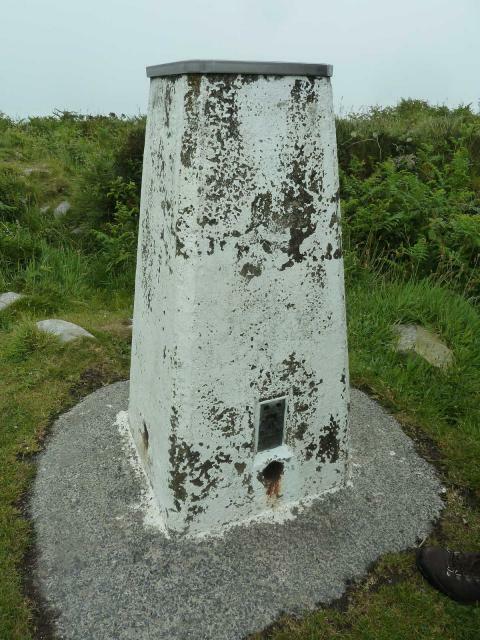 After bagging the Balwest rivet a short, stiff walk affords one with the trig, monument and wonderful 360 degree views. 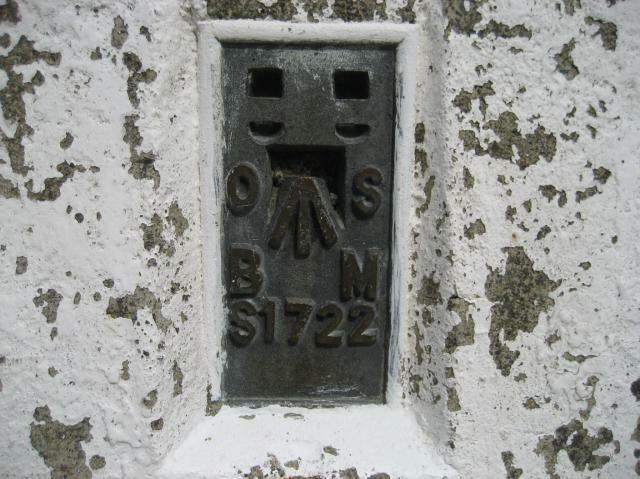 Spider covered with view indicator to commemorate QE II Golden Jubilee. 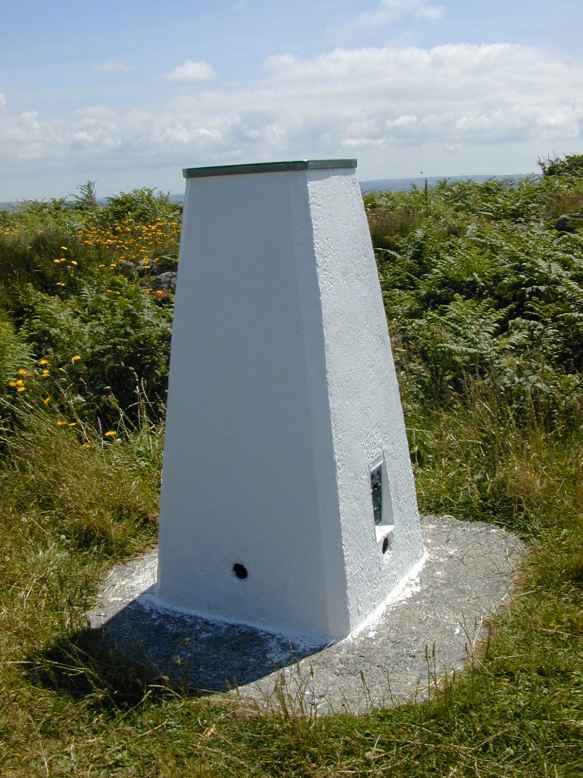 Trig painted white. 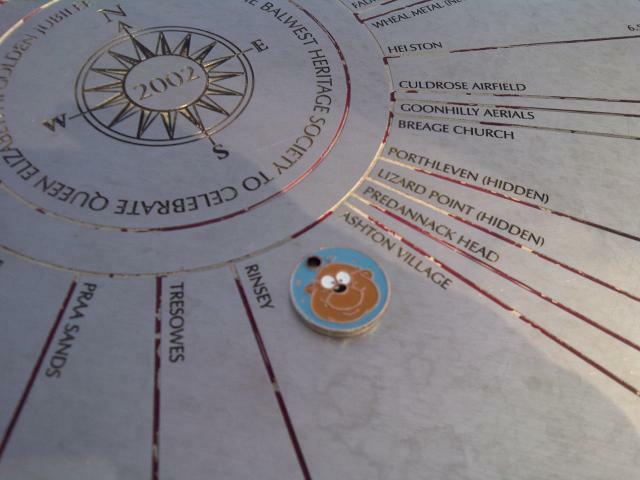 Most southerly HuMP. 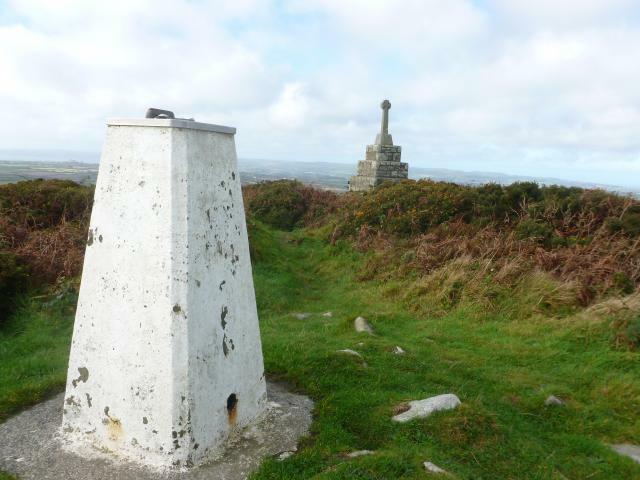 Nice walk up track to Memorial and pillar,lovely location,great views on a beautiful evening .Unaware of difficulty awaiting at next venue. 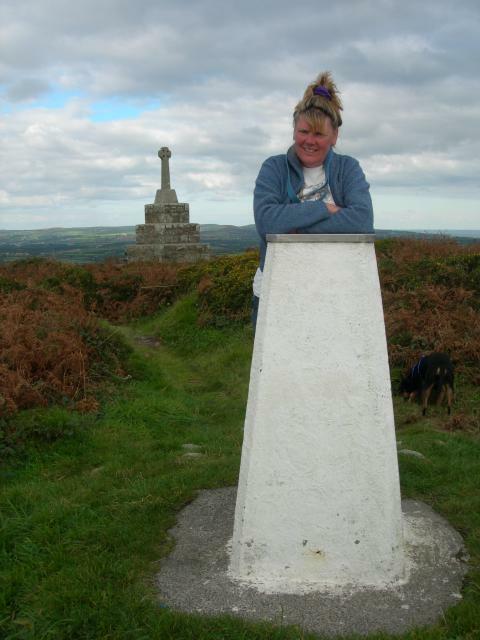 Lovely walk up from farm track to the summit. 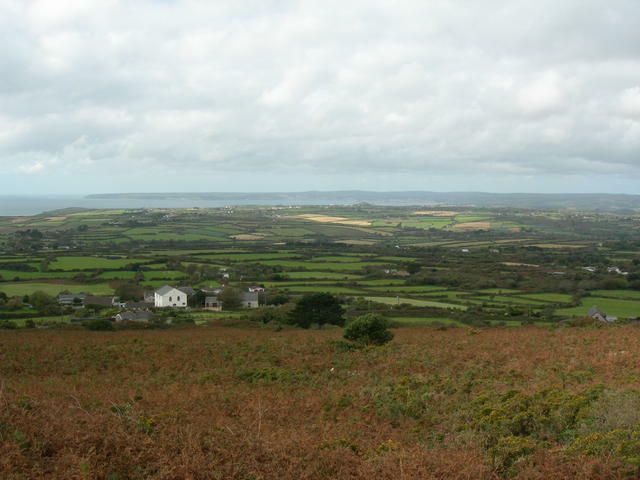 Two former granite quarries passed and history lesson that Cornwall's Kaolin industry began in this very area. 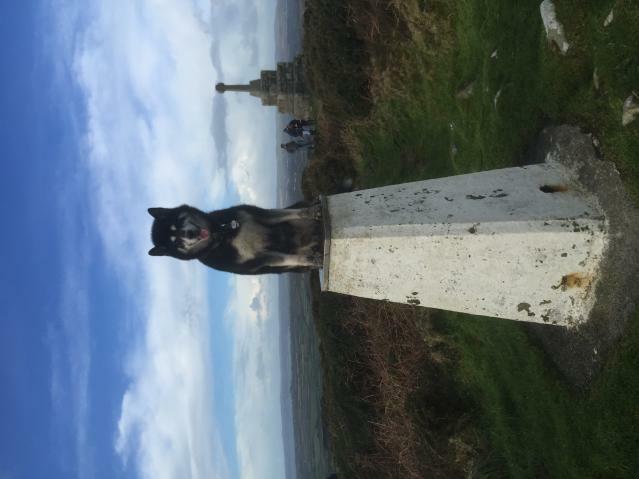 Impressive war memorial. 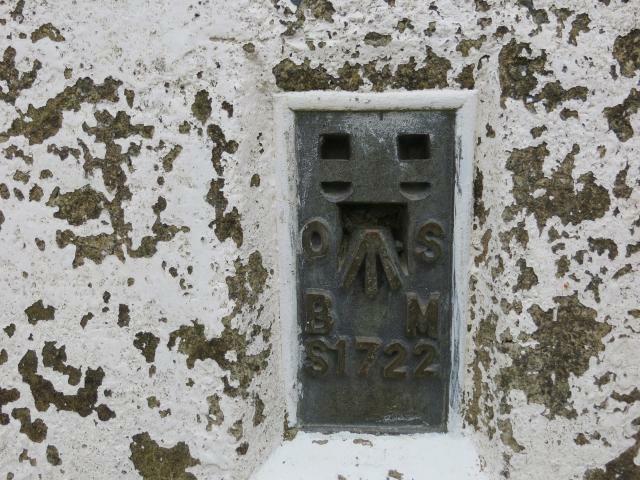 I'm less than a purist because I find that a toposcope on the top of the pillar gives this now disused pillar a lovely function. I wouldn't advocate every pillar had one but those with excellent all around views could serve another good service. That's providing that vandals stay away! Today was not a day for excellent views - a day too late, but there will be others I'm sure. 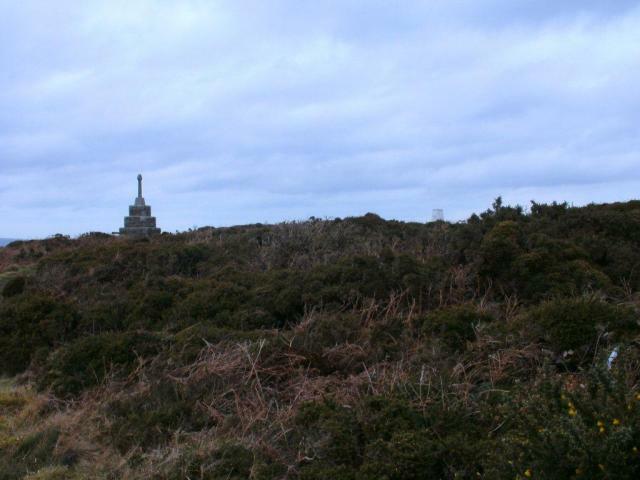 The pillar stands on top of a gorse and bracken covered hill to the west of Helston. 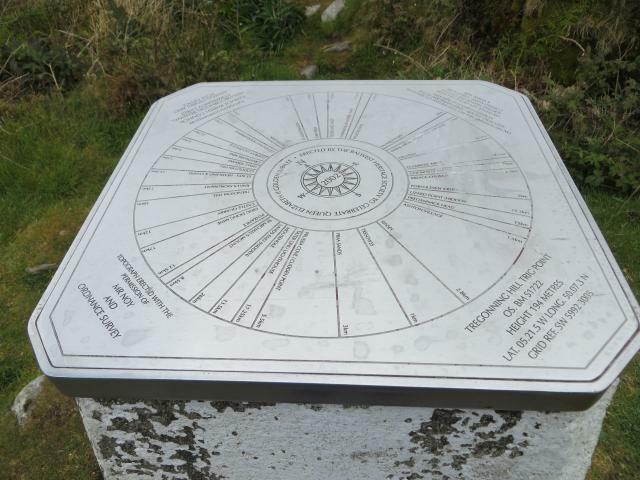 The site was reached by footpaths from the bench at Balwest to the south. 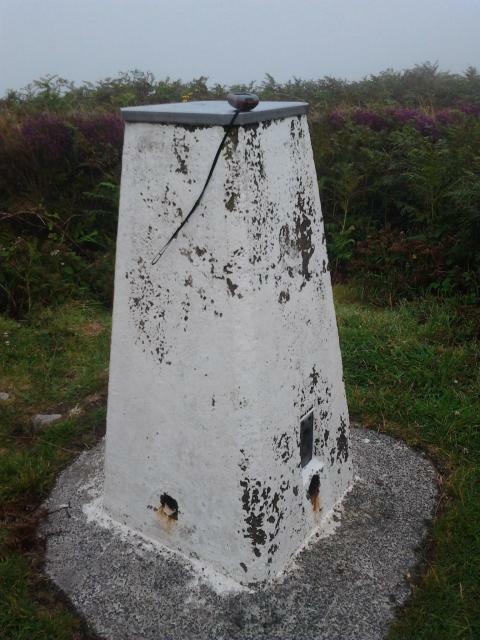 The trig is painted white, has FB S1722 and it is topped with a shiny topograph; obscuring the spider and loops. 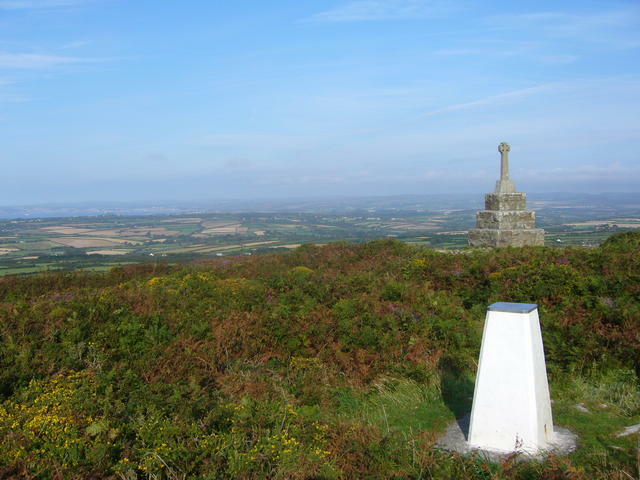 It has a fine view to the north over lower farmland to Carn Brea and St Agnes Beacon. 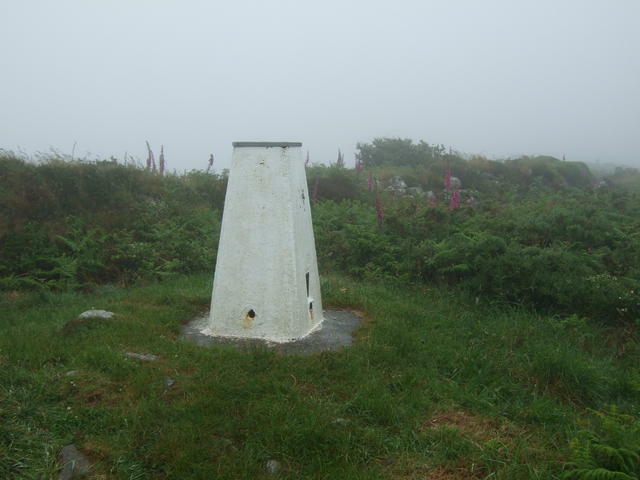 In the west Godolphin Hill, St Ives Bay and the mist covered hills and moors of Penwith could be seen. 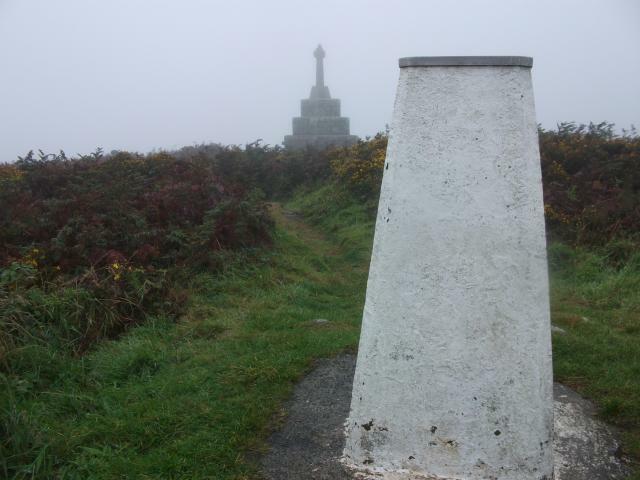 Mist was rolling in from Mounts Bay to the south. 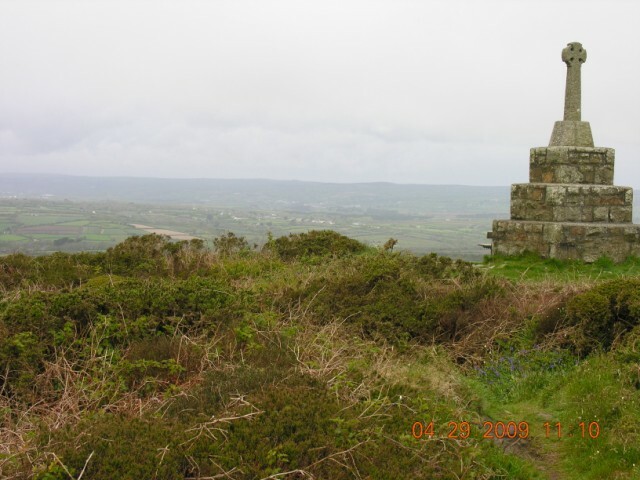 Many of the paths on the hill were bordered by foxgloves. 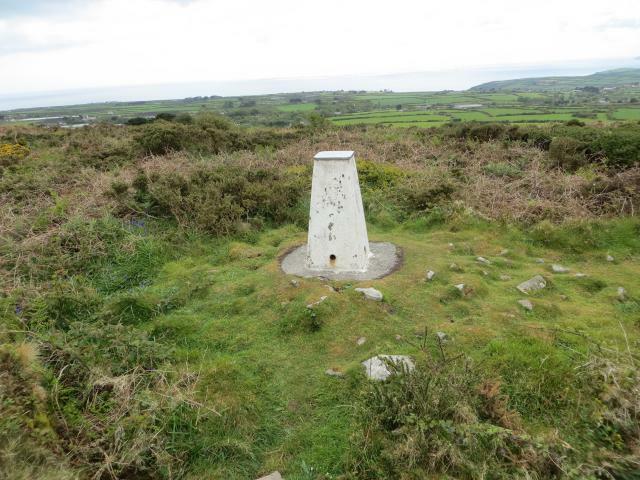 The trig is inside a small Iron Age hillfort. 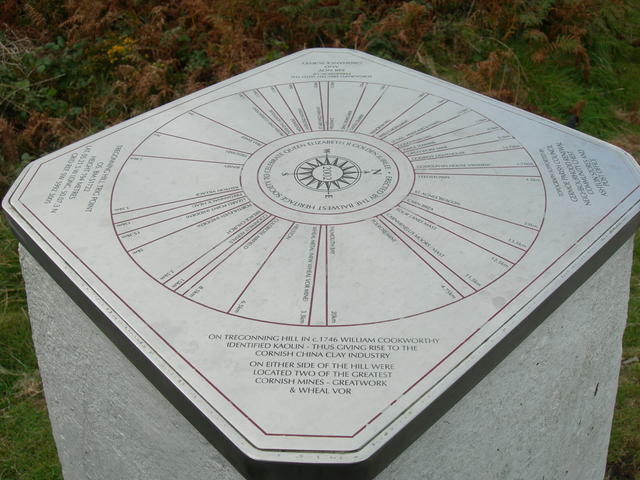 The hill is within the Tregonning and Trewavas District of the Cornish Mining World Heritage Site; some details of its history are noted on the topograph. It has also been designated a SSSI for a rare species of liverwort. Lovely memorial on a lovely March Sunday. The nearly-setting sun was beaming golden rays of light through cloud onto the sea as I went about logging this pillar. 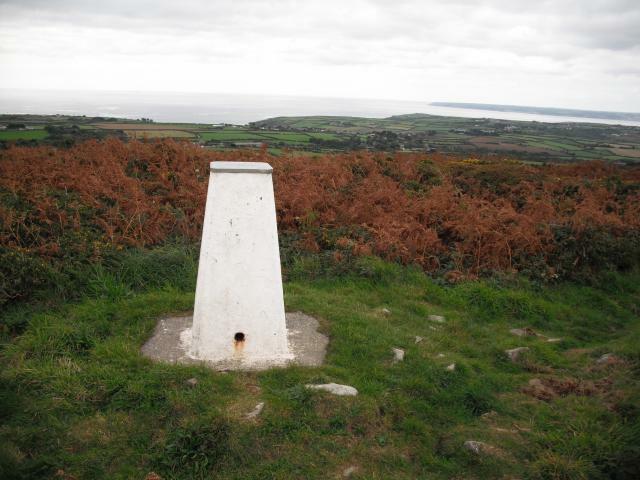 The scenery in every direction was outstanding, just only a little bit hazy in the direction of Falmouth and The Lizard, which was all that stopped me from giving this pillar full marks. 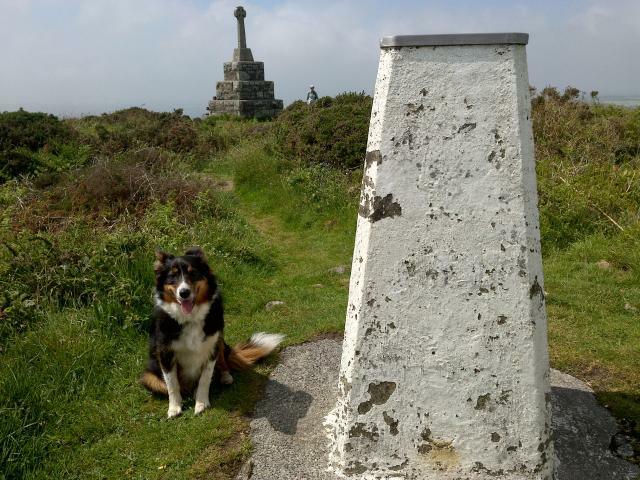 After finding the Balwest Rivet the geohound & me walkled up to this Trig and the War Memorial.A nice directional dial on top of the Trig. 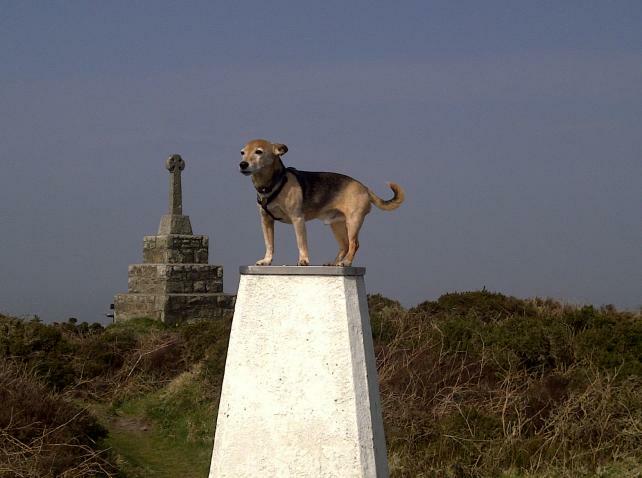 Thank goodness my owner took me for a walk up here. I was getting fed up of being hit with a telescope by Chucky. Met a Parsons Jack Russell at a farm on the way, he wouldn't stop barking. It was a lovely day and I saw a helicopter. Why is my owner always snogging another bloke? 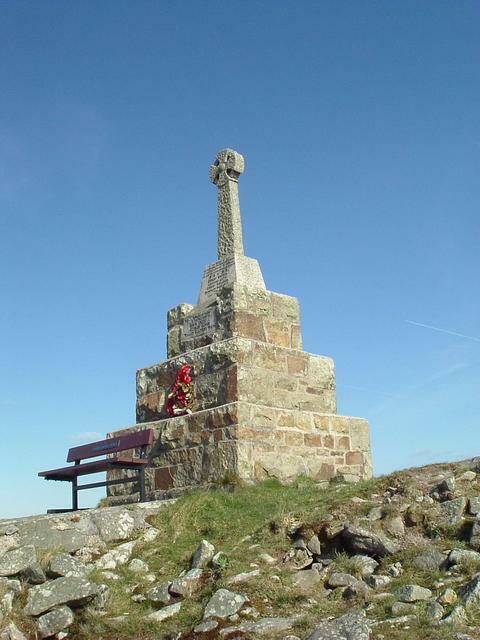 This has a gorgeous position at the top of the hill with the War Memorial adjacent and the ancient preaching pit for the local miners of days gone by. 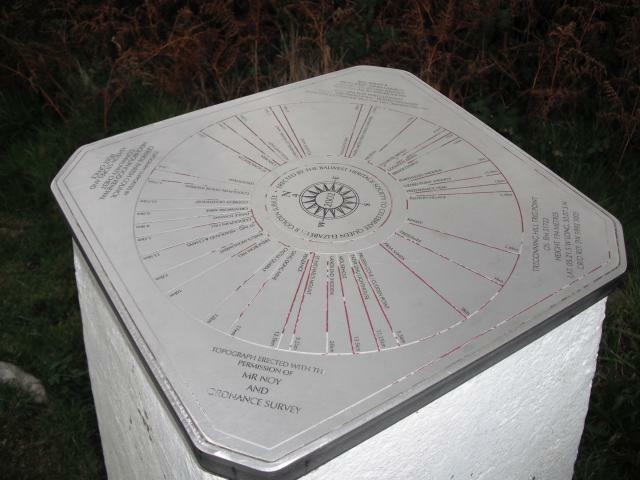 The pillar is brilliant white with a fantastic silver directional plate on top (2002) with distances to local landmarks and villages. A nice clean metal plate. 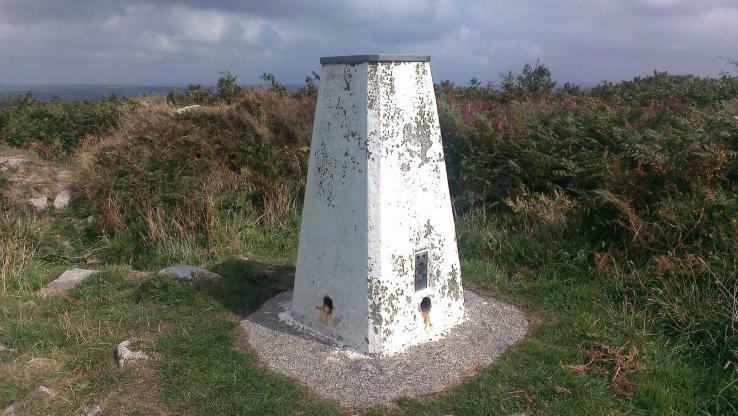 Second visit to the trigpoint that started me back visiting trigs and finding this site. 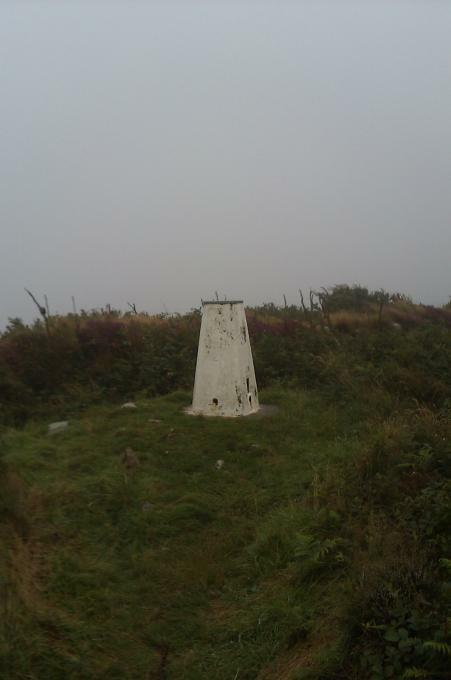 parking near the bench to the west and a good path from there,misty and wet so no views. 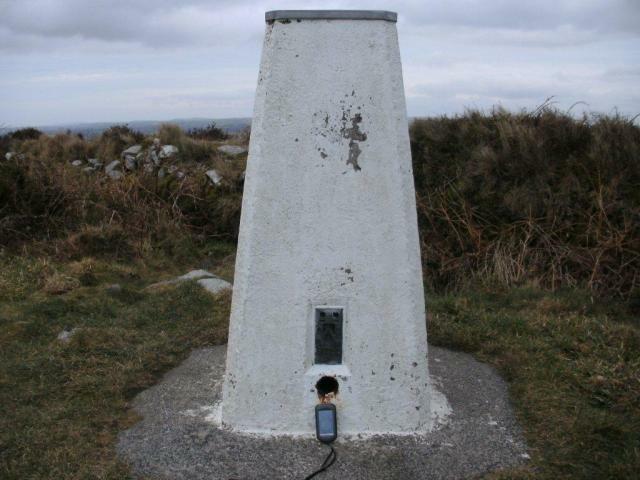 It�s a steep(ish) climb up the metalled track to this Primary pillar from where I left the car, adjacent to YSM011 (TP0326), and then a muddy walk along the ridge to get to this one. 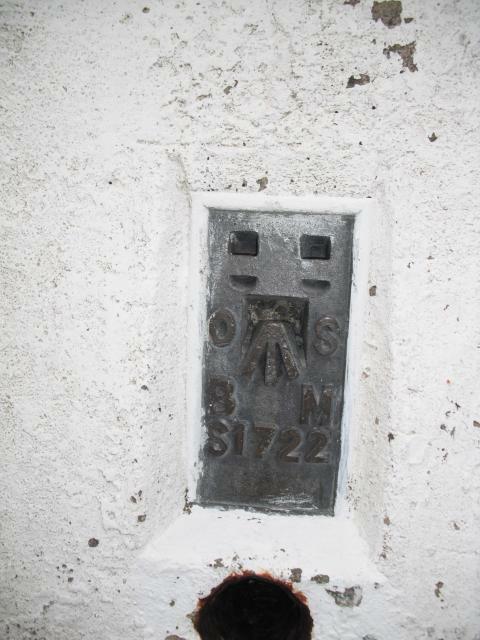 The pillar has been fitted with a nicely made, stainless steel Topograph; probably the best example of one that I�ve seen; hence the �Slightly Damaged� condition report. It also sports a nice coat of white paint. 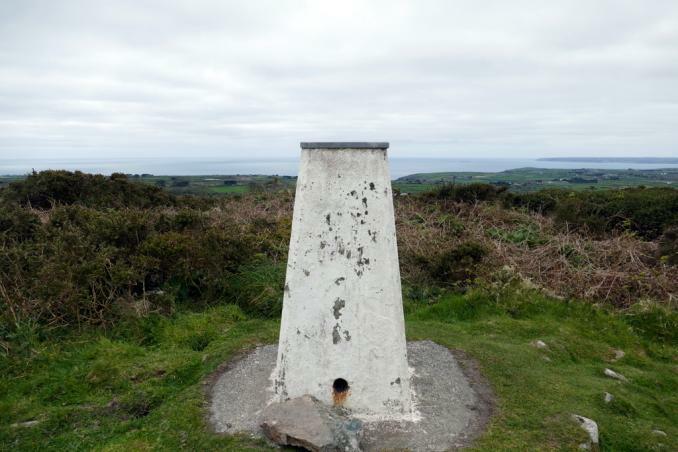 On a clear day, the views would be excellent and well worth the climb. Today was a bit hazy but you could still see for miles all round. 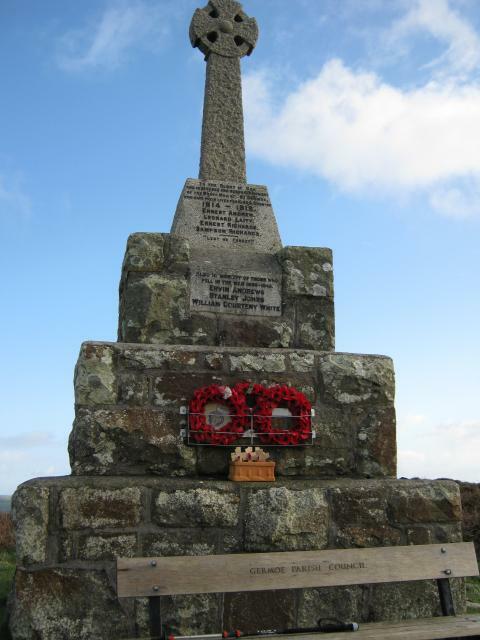 The hill summit is dominated by a large memorial, dedicated to those locals killed in the two World Wars. 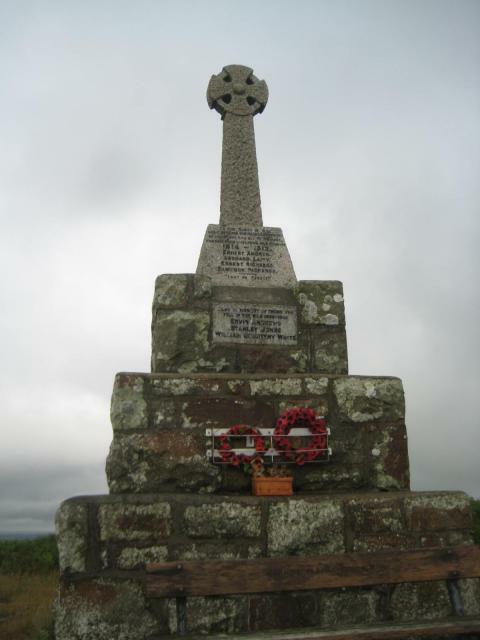 Germoe War Memorial is built on the rampart of Castle Pencaire, an Iron Age Hill Fort. 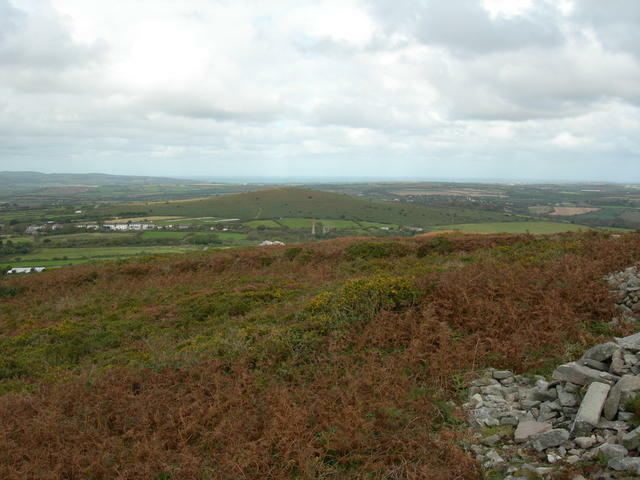 On the south side of the hill is a Bronze Age Barrow. 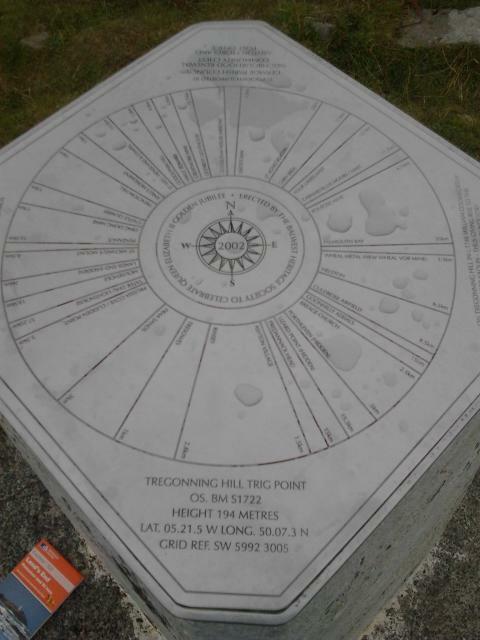 This became the start of a trigpointing habit as shortly after returning home I discovered Trigpointing UK. white, vgc except topograph fixed on top, hiding spider. By war meml, trig not shown on OSLR. 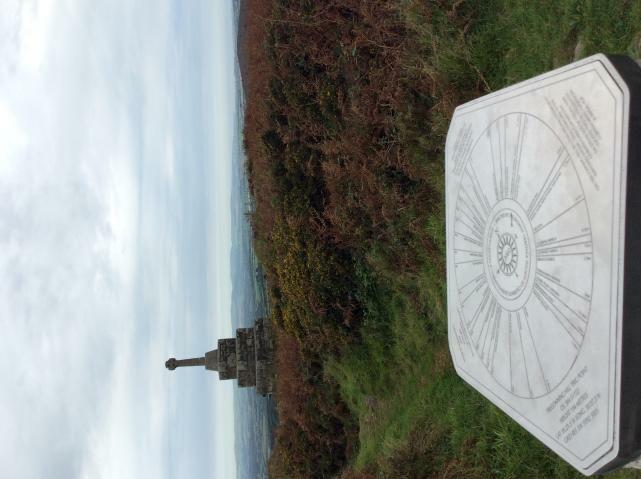 Easy track from 3-car park to W.
staying at praa sands this week so walked up from there,super views and lots of local history up here,eg,the preaching pit. 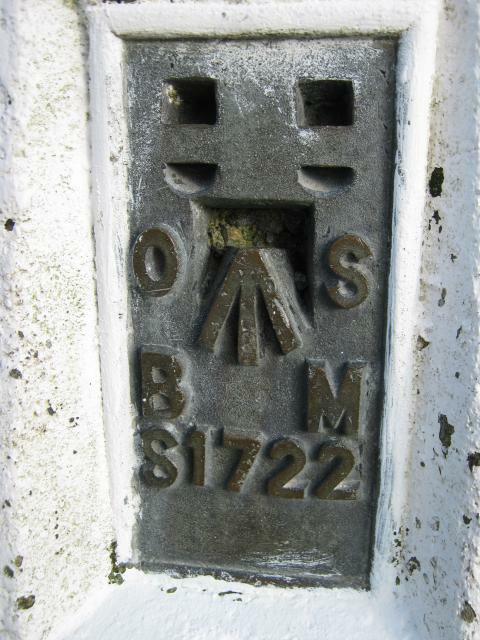 Near to a stone cross that serves as a war memorial for the parish of Germoe. 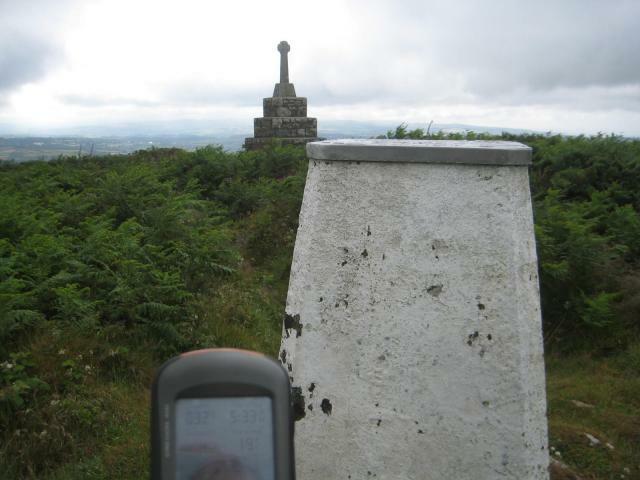 Top of trig nicely converted to a viewfinder. 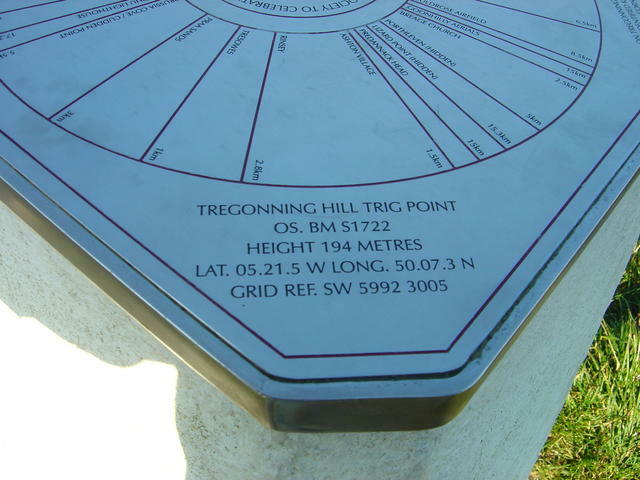 This trig isn't shown on Explorer 7, the predecessor to Explorer 102. 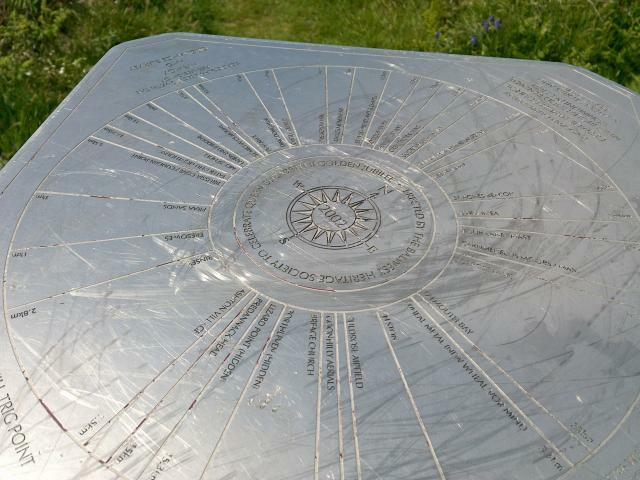 Lovely walk from a nearby sleepy hamlet. 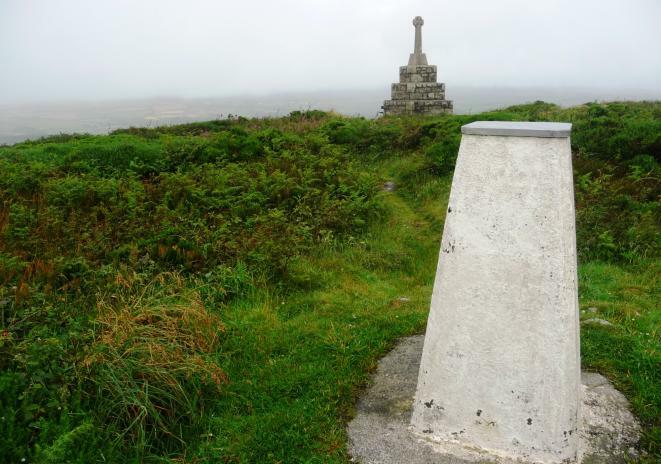 Greta weather and visibility added to the incredible views from the pillar - well worth a visit. 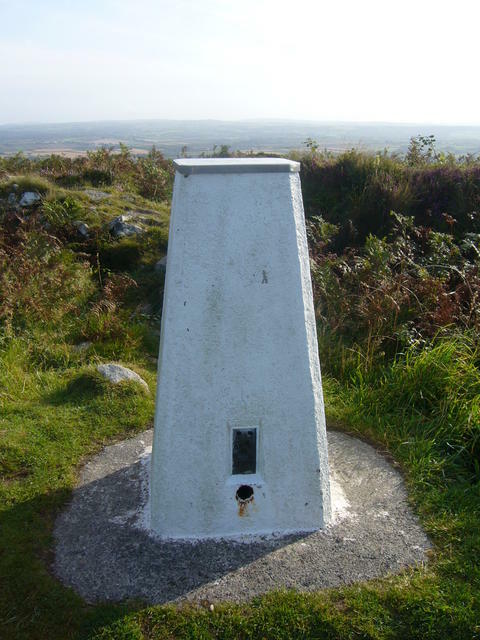 The pillar itself has been lovingly restored and re-painted, but they have covered the screw in top with a large steel plate with one of those line drawings indicating the focal points on the horizon. Agree entirely with Slapster and some photos to prove it. 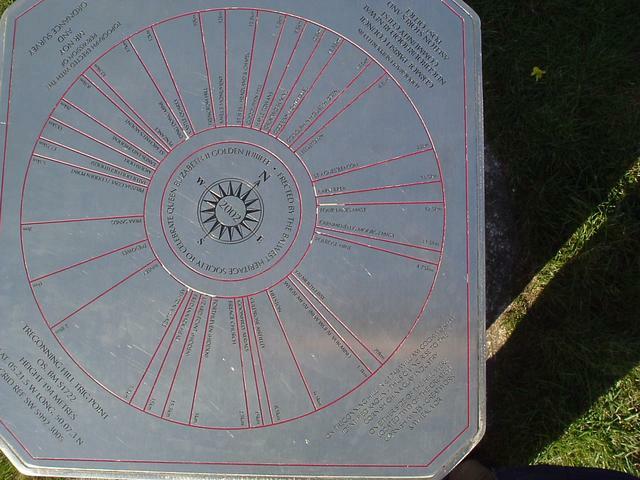 Plate on top of the trig. 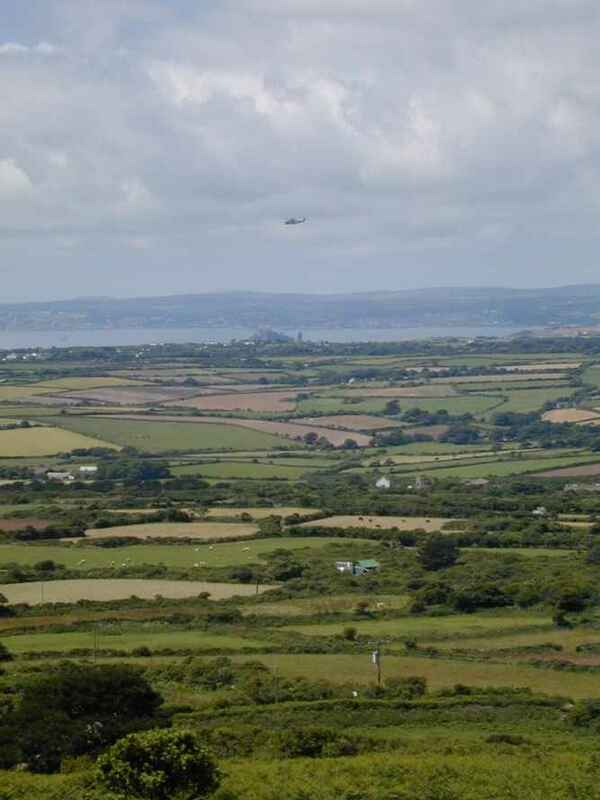 View West to Penzance with St Michaels Mount below the 'copter.